One of the greatest things about my project has been the people that I’ve met. TJ followed me on my journey in 2011 and contacted me about hitting the trail together. We ended up finally hiking together on Loon Day last year where we ended up seeing 8 loons (6 all together in Trout Lake). This spring, he contacted me to tell me about his new project. TJ has lived with Type 1 Juvenile Onset Diabetes since he was 15. This past year, he decided to help with the cause and raise money. He put his passion and conviction together to create a project called “Hiking for Diabetes”. He’s looking to have folks sponsor his hiking over this summer to raise money for the Juvenile Diabetes Research Foundation. He’ll also be doing a raffle that includes my driving guide and other fun stuff. With over 25.8 million people in the United States with Type 1 or 2 diabetes, I’m sure you know someone who deals with this disease. 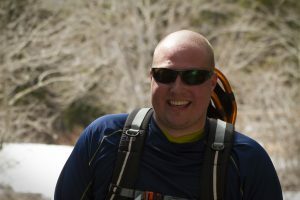 Please check out his site hikingfordiabetes.com and partner with TJ for a sweet cause! As a side, TJ hiked with me to Bullhead Lake in Many Glacier. Blog on that coming soon! Also, check out my friends over at the Glacier County Honey Co and their blog about Mr. Fallon.